Shopping for Penny Dreadful Action Figures? Features 18 points of articulation! Individually numbered and limited edition! Entertainment Earth Convention Exclusive! “It’s alive! It’s alive! (Well, not really, but its still fun to play with!) Why spend countless hours trying to piece together a creature from spare parts when you can have Dr. Frankenstein’s creation without all the mess? Thanks to Bif Bang Pow! you can now own the doctor’s first born with the Penny Dreadful The Creature 6-Inch Action Figure - Convention Exclsuive. This detailed figure features The Creature in an all black Victorian style trench coat with a high neck wrap to help hide the not-so-pleasant surgery of his father. The coat itself is made up of a soft and bendable PVC plastic. 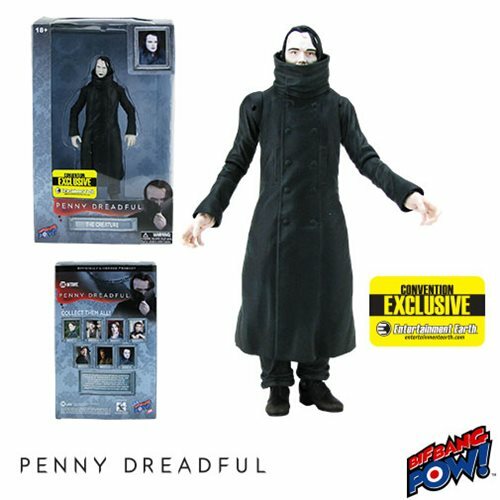 This first ever 6-inch figure of the popular Penny Dreadful character features a whopping 18 points of articulation and will fit nicely beside the 6-inch figure of Dr. Frankenstein (sold separately). With a production run of only 2,400 pieces, collectors will want to grab this individually numbered and limited edition Entertainment Earth convention exclusive before it disappears into the night. Ages 18 and up.